Had come across mentions of this app 2-3 weeks ago, but only recently got around to actually downloading and using it. 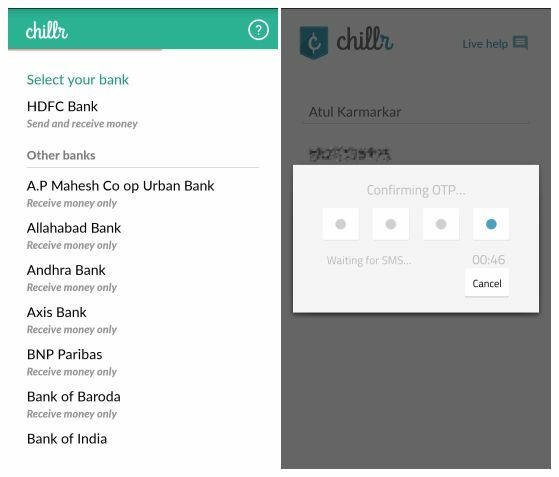 An addition to the world of payment related apps, Chillr lets you send money to anyone in your phonebook who has a bank account. It does away with the usual practice of having to add a beneficiary account along with bank details and wait anywhere from 30 minutes to 24 hours to be able to transfer money to that beneficiary. There’s no ‘wallet’ either. 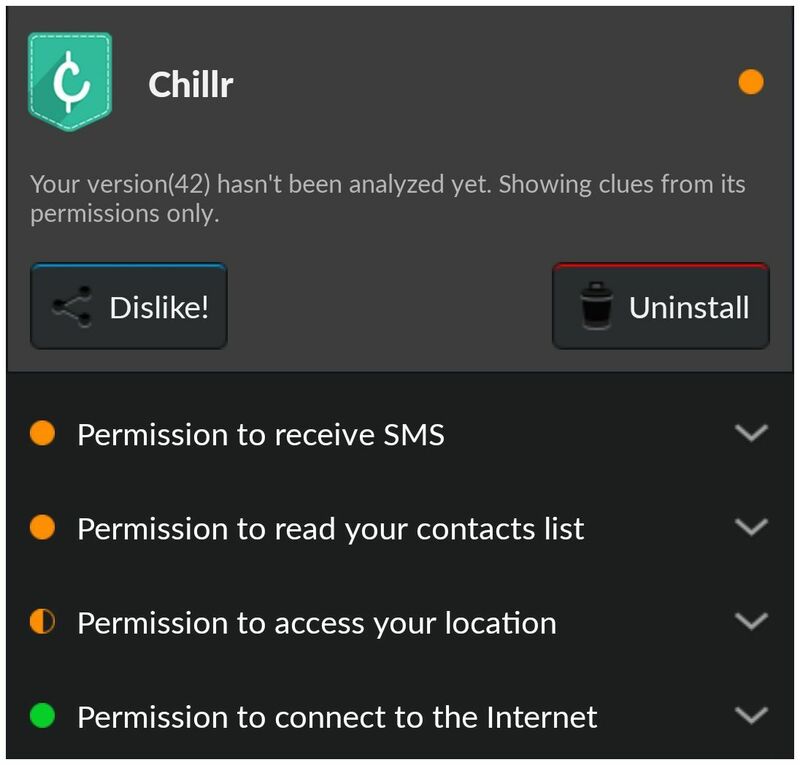 Unsurprisingly, it is a moderate privacy risk with the access it needs. Presently, only customers of HDFC Bank are allowed to send money, but there’s a whole bunch of other banks which can receive money. Presumably, sending money will be extended to customers of other banks (members of NPCI) and merchants at some point later. Add name and mobile number, wait for and then input the OTP you get via SMS. Seeing a message that my mobile number was not registered with the bank did lead to a WTF moment for a second. However, that was taken care of by logging into my Netbanking account and generating an MMID. Adding email id is optional. There’s also a bunch of other options from the menu which you can access. 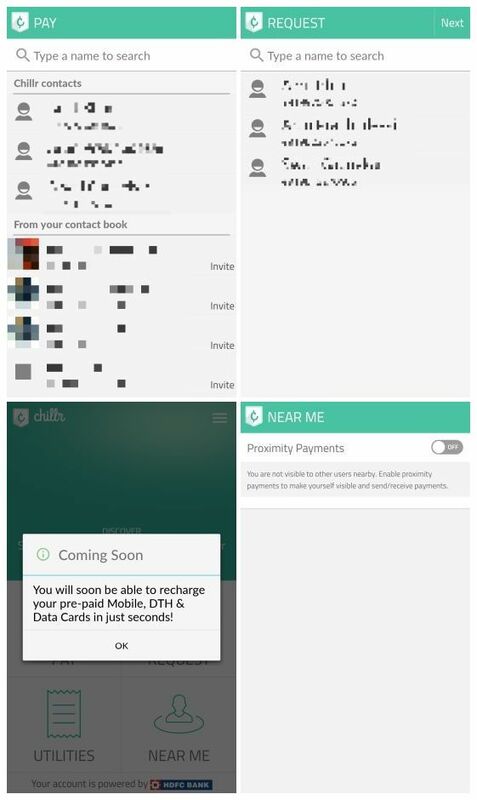 The home screen has four main sections, and tapping ‘Pay’ takes you to a screen with names of those who have installed the Chillr app and all other contacts. 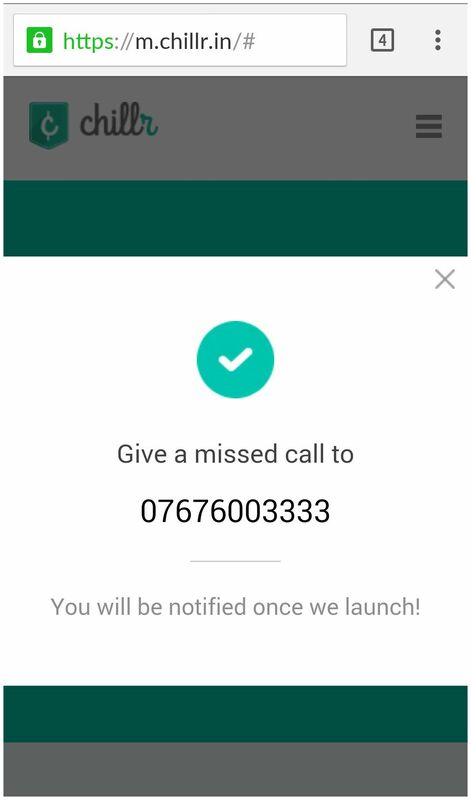 You can also Request funds, make payments towards Utilities and recharges (Coming Soon, as the app says). This would also allow for splitting food bills with friends or sharing rent with flatmates. The ‘Near Me’ function allows payments to those who are physically near your location. Recipients need to download the app and link their bank account in order to receive the money, which they’re prompted to do via SMS once you initiate a transfer. Besides the m-pin itself, there are other security measures in place as well. 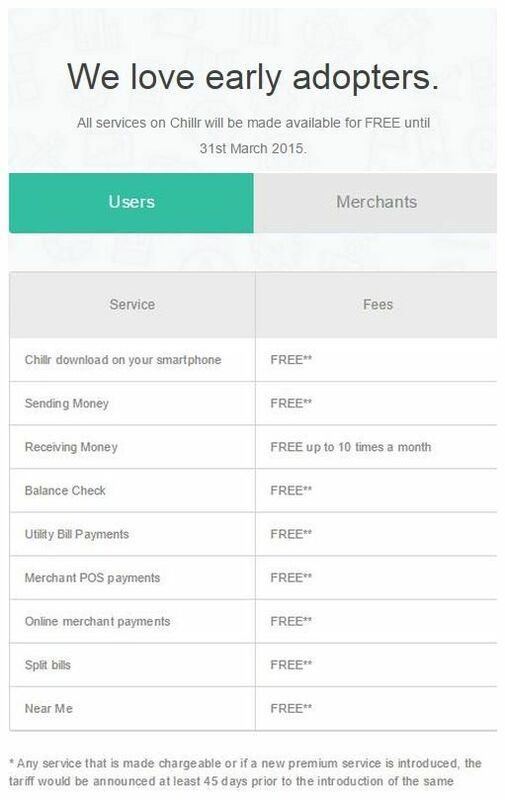 Presently, all Chillr services are free till 31-Mar-15 and they say new charges if any, will be notified 45 days in advance. There is a cap on receiving money via the app, which is 10 times in a month. The FAQ on the HDFC Bank website says Rs.3.5+service tax is levied on each transaction while sending money. A maximum of Rs.5,000 can be transferred at one time and also per day, as well as 10 transactions per day. As of now, the app is available on Android and is expected to launch on other platforms as well. There’s a detailed FAQ on their website as well as information on the HDFC Bank website which should answer any queries you may have. One odd thing I noticed was that none of the information on their website was accessible via mobile. Still seemed in pre-launch stage. Update: It seems to be available on iOS also now, although their website still doesn’t say so.